Planning permission has been given in Scotland and England for a £7.3m improvement project on a nearly 200-year-old cross-border bridge. 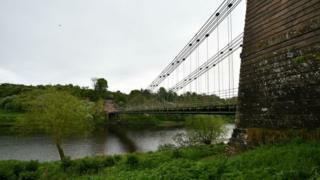 The Union Chain Bridge scheme was approved by Scottish Borders Council (SBC) on Wednesday. Northumberland County Council (NCC) gave the green light from their side the following day. It is now hoped the project can secure further National Lottery Heritage Fund support to allow it to proceed. Both NCC and SBC have already committed £1m each to its overhaul which is designed to safeguard its long-term future. A first round national lottery funding bid secured a £360,000 development grant with a second round submission expected to be made in May. In the meantime, it has received planning permission on both sides of the border.